Freelancers. Contingency employees. Contract employees. Temporary workers. Free-agent employees. Those terms apply to an increasing percentage of the U.S. workforce and were terms used in a recent article in USA Today –“Freelance workers reshape companies and jobs.” According to researchers cited in the article, at least 10 percent of the current work force are cotingency workers. Some researchers of the workforce say that number is closer to 20 percent and will be 25 percent by next year. I’m particularly interested in this shift in the workforce, as it applies to a number of my friends and former students and will be applying to more and more of the college students I am working with. Almost all of us know several friends and family members who are now in the category of freelancers. They have been downsized or “right-sized” from a full-time job. Some of the communications graduates who were my students found that they were hired for communications jobs for, say, 30 hours a week so that the company didn’t have to provide benefits. 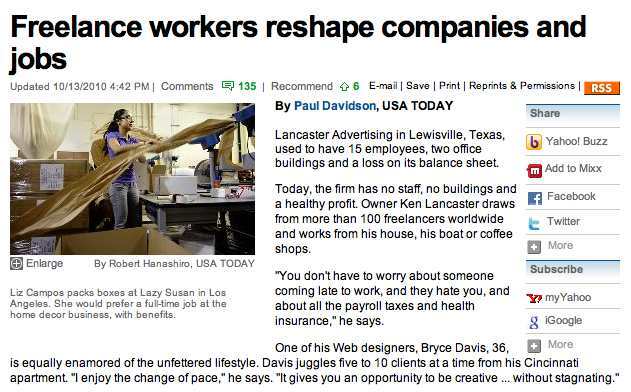 The USA Today story included several different businesses as examples of using fewer full-time employees and more freelancers — an advertising firm, a warehouse and a pharmaceutical company. At least two of the free-agent employees interviewed for the story said that they liked the challenge of working for a variety of employers and having a range of jobs so they aren’t “stagnating.” But it was clear that other freelancers interviewed for the story were working these temporary jobs because those were the jobs that were available. The main advantages for having a temporary workforce are for the businesses. Businesses can be more flexible. They don’t have to go through the process of eliminating employees. They don’t have to pay as high a salary or pay benefits. The owner of the advertising firm said he could get Web design work done by freelancers at about 10 percent the cost of full-time employees. That advertising first had gone from having two offices and 15 employees to the owner working out of his home and working with 100 freelancers. That’s a change for managers, too, as they must change management skills from traditional in-the-office strategies and expectations. Part of helping students prepare for this changed employment world starts with understanding some of the basics. Earlier this semester, an editor from the campus newspaper spoke in class about the process for students who wanted to get their stories published in the paper. In describing the kinds of writers at the paper, the editor described freelancers as those who worked for free. That may be true for the students publishing at the campus newspaper. But for the many students who will graduate and then freelance to make a living, they need to understand that the term has to do with lack of allegiance to a particular employer (i.e., knights who would use their skills with their lance for anyone who would employ them) not to the salary level.